What is a coffee substitute or coffee alternative? Coffee replacements are combinations of roasted grains, blended to provide coffee flavor without coffee acidity or caffeine. This product line generally includes combinations of roasted grains, chicory, and sometimes dandelion root. They're a great caffeine-free alternative to brewing up a cup or pot of coffee. Our Recommendation: There are many great coffee alternatives, but we recommend Dandy Blend. * You can click the above links for more information at Amazon or see our reviews below in this guide. Why Choose An Alternative Vs Regular Coffee? For many of us, coffee is the first step in a busy day. However, if you're trying to cut back on your caffeine intake, it can be tough to find a flavorful replacement for caffeinated coffee. If the occasionally bitter taste of decaffeinated coffee doesn't appeal to you, a tea or grain based coffee alternative may hit the spot! For brewing convenience, teas that taste like coffee offer terrific flexibility. 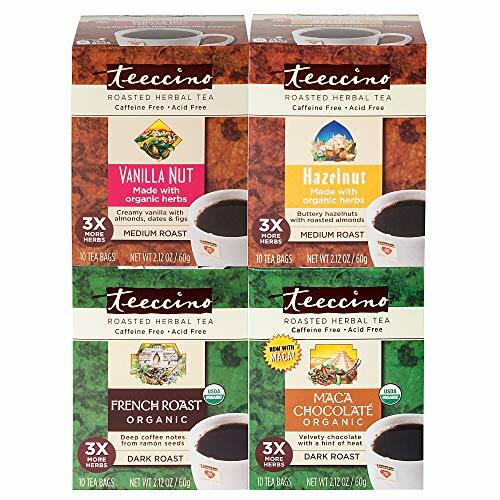 The Teecino Coffee Alternative Variety Pack lets you brew up a single cup of flavored coffee substitute to the intensity of your choice. While many flavors are based on roasted grains, the Teeccino gluten free products made with dandelion offer those with gluten intolerance a delicious chance to enjoy a smooth coffee substitute. Teecino comes in a variety of flavors from vanilla bean to chocolate. It should be pointed out that many of these products contain almonds; those with nut sensitivities should review labels carefully. 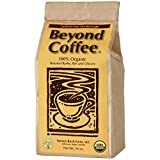 If you're looking for an organic coffee alternative, consider Beyond Coffee. This dark combination of roasted grains including rye and barley with chicory root. It is roasted and bagged in Maine. This substitute for coffee can be brewed in a drip pot, a french press or a percolator and also works well in reusable K-cups. You can also mix this with regular coffee to slowly reduce your caffeine intake over time. 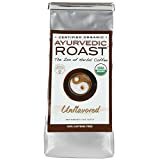 Ayurvedic roast is another of the ground healthy coffee alternatives on the market that includes barley, rye and chicory root. In addition to these roasting agents that provide a dark, rich flavor, Ayurvedic blends includes herbal supplements to help you stay alert and feel the brain boost generally associated with caffeine. Ashwagandha, also known as Indian Ginseng. It's credited with boosting concentration, combating the effects of stress and healing your immune system. Shatavari, or wild asparagus. This herb is credited with reducing the symptoms of menopause and aiding in memory retention. If you are interested in coffee replacements but need a gluten free option, Dandy Blend is an excellent choice. This dandelion coffee substitute can be mixed directly with water; no brewing needed. Dandy Blend is very sensitive to moisture and should be purchased in small batches and used quickly. Double wrapping in airtight containers and refrigerating it can also protect it. If exposed to too much moisture, this product turns into a brick and loses flavor. You can vary the strength of the flavor by increasing the amount of Dandy Root powder you add to the water, and you can mix it hot or cold. This product has a natural sweetness, so if you like your coffee with sweetener, you may be able to cut back. Pero, like Dandy Blend, is an instant coffee substitute. This product can be mixed with hot or cold water for coffee-flavored beverages. By upping the ratio of Pero powder to water, you can raise the flavor intensity. My doctor told me to quit caffeine! What's the best coffee substitute? The best coffee substitute is the one you're going to use consistently. If you are accustomed to starting your day with a cup (or a pot) of coffee, try one of the ground grain replacements and blend it with your favorite coffee over time to slowly wean yourself off caffeinated coffee. Is there a tea that tastes like coffee? Teecino offers coffee fans the chance to carry tasty decaf blends in a tea bag and brew up a cup whenever they like. These blends are made with roasted grains and may have additions including carob for extra flavor. Decaffeinated coffee is awful. How are these any different? Decaffeinated coffee is generally made from robusta beans, and is often bitter and rather flat. However, the coffee replacements listed above are made with roasted and ground grains, the rich flavor of chicory root, and sometimes dandelion root. These products impart a rich, varied flavor. Will they taste just like your favorite coffee? The coffee habit can be hard to quit. Using a great-tasting coffee substitute, blended in over time, is a great way to wean yourself off a daily dose of coffee. While these beverages may not provide the exact flavor of your favorite coffee blend, you can blend many of these products into your regular ground coffee and allow your taste buds to adjust.